Camden Holly Springs features one, two and three bedroom apartments and townhomes in the heart of Houston’s Westchase District. Our pet-friendly apartments offer a peaceful retreat from big city life without sacrificing the convenience. Unwind by the private lake, or take a walk surrounded by lush landscaping and beautiful courtyards. You’ll love living less than 4 miles away from the shops, restaurants, bars and boutiques at City Centre and Memorial City Mall. Our prime location also offers direct access to Terry Hershey Park as well as easy commutes via the Sam Houston Tollway, I-10, I-69 and public transit. Take a look at our available Westchase apartments now! For those who enjoy an active lifestyle, Camden Holly Springs provides a variety of amenities. Take advantage of the high-endurance fitness center with cardio and free weights, a private indoor sports court with two basketball goals, or the resort-style pool with tanning shelf and WiFi. Our pet-friendly community also features ample greenspace and trails perfect for peaceful walks with your loved ones. Need to get some work done? Our business center is the perfect place. Use one of the available computers complete with printer and fax, or enjoy the workspace and nearby coffee bar. Host your next event in the social lounge, or let your inner chef shine at one of the outdoor grills with dining areas. Each Westchase apartment includes spacious kitchens with stainless appliances, wood-style flooring, and granite countertops, as well as garden tubs and full-size washers and dryers. Relax on your own private patio in the center of everything Houston has to offer. Our townhomes are the closest you can get to home living with all the conveniences of an apartment. Each townhome offers one or two bedrooms and includes an attached garage. Enjoy open concept living with huge windows letting in beautiful natural light, modern finishes and luxury details. At Camden Holly Springs, you can have it all. Residents receive a technology package included in the total monthly rent with a savings of up to 56% off retail. This money-saving package includes high-speed internet up to 150 Mbps and over 140 digital video channels through Xfinity. Use the Xfinity Go app on your smartphone or tablet to access your digital video anywhere! Interested in Houston's best 55+ apartment community located just minutes from Camden Holly Springs? 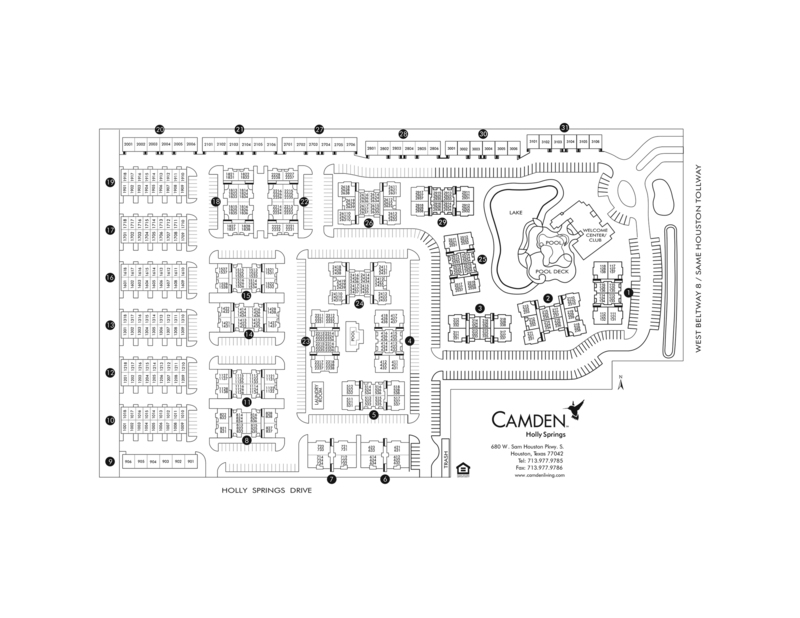 Check out our sister community, Camden Royal Oaks! Detached one-car Garages are available for $85 per month. Detached two-car Garages are available for $125 per month. Many of our apartment homes include Garages with extra storage space! Please call for details.